Yet another aviation squadron commander has been fired as the turmoil rippling through Marine aviation refuses to take any time off for the holidays. Lt. Col. Wade Workman was relieved of his duties Wednesday as head of Marine Fighter Attack Squadron 232, which has seen two of its F/A-18 Hornets crash since Workman took command on Jan. 15, said Capt. Kurt Stahl, a spokesman for the 3rd Marine Aircraft Wing. A third Hornet from the squadron crashed in England in October 2015. Maj. Gen. Mark Wise, commander of the 3rd Marine Aircraft Wing, decided to fire Workman due to a ” loss of trust and confidence” in his ability to serve as squadron commander, Stahl said. 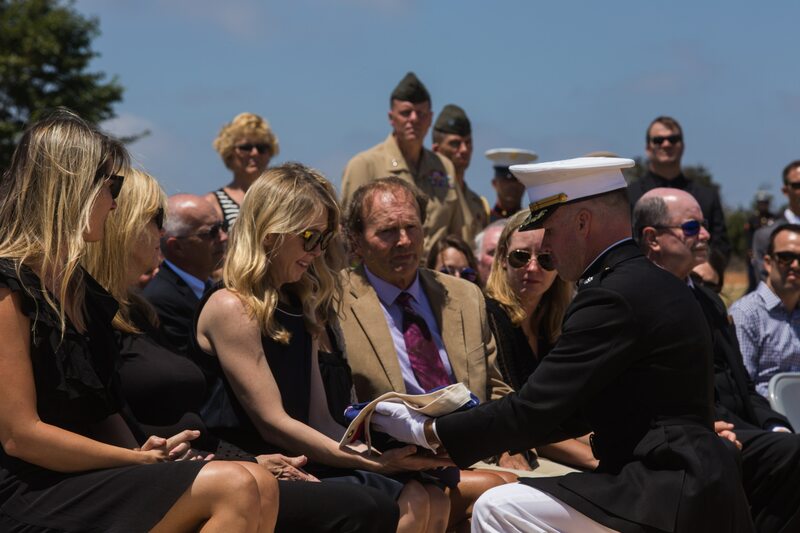 Lt. Col. Wade Workman presents the flag of Maj. R. Sterling Norton, a fallen pilot with Marine Fighter Attack Squadron 232, to his wife during his funeral ceremony at the Miramar National Cemetery, San Diego, Aug. 12.Photo Credit: Sgt. Lillian Stephens. The Marine Corps is struggling through an aviation readiness crisis brought about by years of wars, budget cuts and delays in replacing older aircraft – all of which have left many aircraft unable to fly. Aircraft parts can be hard to obtain and with fewer aircraft flying, pilots are not getting enough time in the air. Stahl did not say specifically why Wise decided to relieve Workman. “There was an unhealthy command climate that negatively impacted trust within the unit that is critical to effective operations,” Stahl said. Workman declined to comment on Wednesday. Two F/A-18C Hornets from the squadron crashed over the summer. One of the squadron’s pilots, Maj. Richard Norton, was killed on July 28 when his Hornet crashed during a training mission near Marine Air Ground Combat Center Twentynine Palms in California. On Aug. 2, a Navy pilot successfully ejected from an F/A-18C that was on loan from the squadron. The back-to-back crashes prompted the head of Marine aviation to order all non-deployed aircraft to suspend flight operations for 24 hours. Separately, Maj. Taj Sareen, was killed on Oct. 21, 2015 when his F/A-18C crashed in England. Workman is the fourth commander in the aviation community to be fired in 2016. On Dec. 2, Wise relieved Lt. Col. Michael E. Hernandez as commander of Marine Aviation Logistics Squadron 11. Wise’s decision to fire Hernandez was based on performance; “No misconduct was involved,” a 3rd Marine Aircraft Wing news release said. And in January, Lt. Col. Edward Pavelka was relieved of command of Marine Heavy Helicopter Squadron 463 just three days before two of the squadron’s CH-53E Super Stallion helicopters collided off Hawaii, killing 12 Marines. An investigation found that the squadron did not have enough flyable helicopters, crews were not getting enough flying hours and morale was low prior to the crash.